NoviFlow and netElastic solve this problem through a disaggregated vBNG solution that combines NoviFlow’s high-performance SDN switches and netElastics’s highly scalable NFV software resulting in greater scalability, performance, and flexibility, along with lower costs. 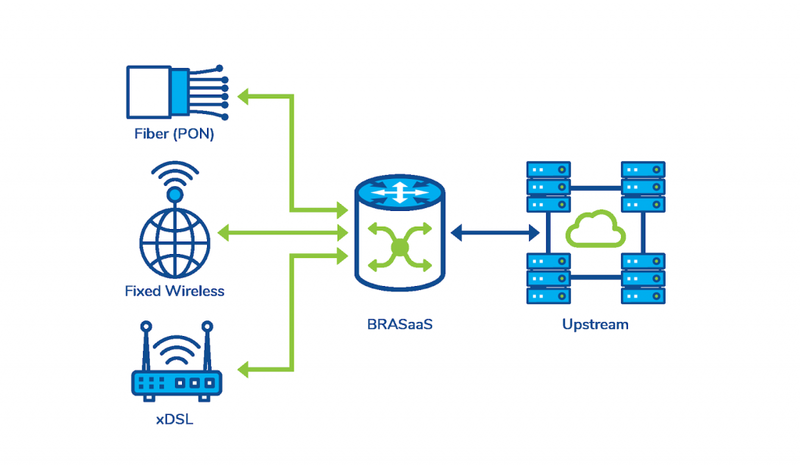 The joint solution enables carriers to realize the true benefits of SDN and NFV technologies while still leveraging existing investments and extends the radical CAPEX and OPEX benefits of SDN-based programmable forwarding planes to the BNG segment. Combines the separation of control and data planes of Software Defined Networks (SDN) with the resource optimization of Network Functions Virtualization (NFV), turning BNG/BRAS functionality into an on-demand service instantly accessible to customers via an online web portal or API. Provides carriers with the ability to offer end users self-provisioned products and services, slashing service delivery costs, management complexity, and the time it takes to deliver new products and services to market. One or more NoviFlow NoviSwitch programmable pipeline edge switches. 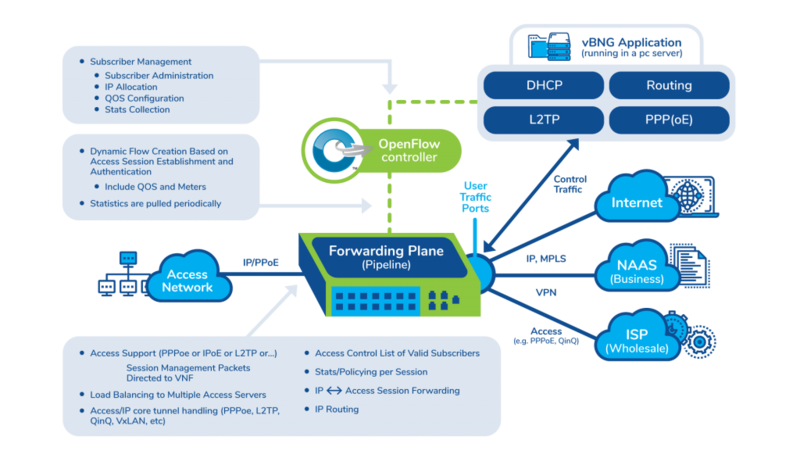 NoviFlow’s line of high-performance fully programmable NoviSwitch forwarding planes leverage the advanced packet handling capabilities of the NoviWare Network Operating Software running on high-performance network processors to significantly boost throughput. NoviSwitch is available in a variety of port configurations, with enhanced filtering options at line rates of 1Gbps, 10Gbps, 25Gbps, 40Gbps and 100Gbps, and support up to 16 million simultaneous flows, depending on the NoviSwitch model. As an added benefit, the NoviSwitch/NoviWare programmable match-action pipeline architecture is specifically designed to simultaneously support in a single device multiple network services such as switching, routing, service chaining, firewalling, load balancing, etc. 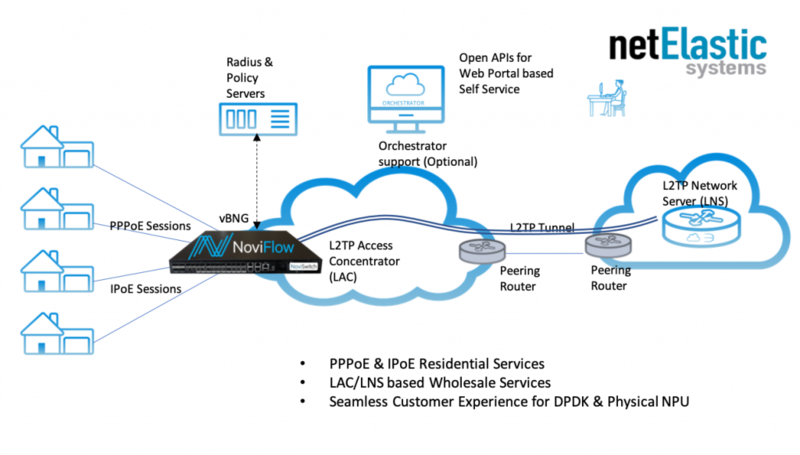 NoviFlow and Ordnance have joined forces to deliver a BNG/Broadband Remote Access Server (BRAS) solution; the first in a family of performance and cost-optimized Virtual Carrier Services uniting NoviFlow’s high performance forwarding planes with Ordnance’s next-generation telecommunications software platform. NoviFlow and netElastic have joined forces to deliver a quantum leap in virtual BNG scalability and performance by combining NoviWare SDN forwarding planes with netElastic’s Virtual BNG offer. The resulting solution provides Network Operators the Flexibility of a vBNG Solution that can Smoothly Scale up to 400 Gbps throughput.